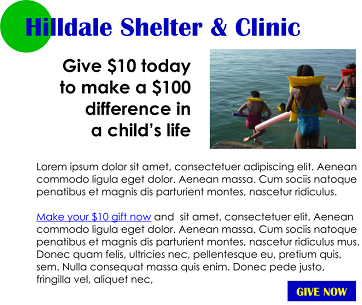 Website pages are an important part of any fundraising campaign. When the fundraising effort is made online only, the online campaign landing page (OCLP) can be the difference maker. It can speed or impede the giving process. As things stand now all online fundraising campaigns should be small-gift campaigns. The amount of money asked for should be scaled to the size of a common everyday purchase such as lunch in a restaurant. A gift of that size, requires no consideration by donors of its impact on their budget. It will be an impulse gift. The trick is not to get in the way of that impulse. People are infinitely more likely to walk away from making a $10 gift because of a slow cumbersome process than because of the impact the gift will have on their personal finances. The OCLP is called a landing page because that’s what happens. People land there after coming from somewhere else. Think of it like an airport. Everybody who has ever gotten off a plane at some large airport for the first time does so with a look of bewilderment. Where do I go? Left, right, straight? After leaving the secured area, comes the line of people holding name cards. Even if you’re one of the names, you still have to search for it among the 10 to 20 others. Then there’s baggage claim. Which one of 78 near identical black suitcases is yours? Let’s not even think about what happens when your bag doesn’t show up. How much better would it be if your private plane were landing at an airport where everything was set up for you to be able to breeze across the tarmac from plane to waiting limo? Which landing experience do you want to offer potential donors? Of course you want the private plane and waiting limo. You want a landing page that eliminates all the distractions from the giving process. The landing page is the airport, not the destination. It’s not a place where you want someone responding to an impulse to give to hang around. An OCLP needs to grab potential donors’ attention and then move them to the next step in the giving process. Nothing should be allowed to get in the way of that movement. The only reason the page exists is to acquire a donation. Anything that does not directly and strongly push visitors toward that goal blocks them from it. Such impediments are not merely dysfunctional elements failing to perform optimally. They are malfunctional and the damage they do is to block the process of making a gift. Whatever is not a push along the path to a completed donation is a distraction. Distractions are the deadly enemy of a successful solicitation. Look as if it is a part of your website. Same colors, same logo, same typeface. You’ve established your brand use it. Don’t make visitors who know your organization and its website wonder if they’ve come to the wrong place. Not have a navigation menu. There is only one place you want a visitor to go—the next step in the process. Do not distract with choices. Have both a text link that is organically part of the writing on the page and a standalone button link to the next step. Some people are more inclined to click text links and others buttons. If your OCLP is deeper than a single screen, one of each link variation should be above the fold and one below. Have a design that is clear, spare, and simple. Visitors should not see the design, only the content. The OCLP is not the place for designers to ride the cutting edge and showcase their creativity and originality. Nor is it the place for cute graphics, multiple type styles, or a rainbow of colors. Have writing that is clear, short, and to the point. An OCLP is not the place for writers to show how smart, knowing, and talented they are. Writing like design should be invisible. It’s the message that matters. And what matters most is getting it into the mind of a visitor as fast and accurately as possible. Not oversell. There is a point in every solicitation, when you should ask for the money. When that point has been reached, continuing to sell endangers the gift. More gifts are lost by failing to ask for them directly when the opportunity arises than any of us would like to admit. An OCLP needs to get out of the way and let donors follow through on their impulse to give. Ideally an OCLP links directly to the donation form. Click to get to the OCLP. Click to get to the donation form. Click to submit the donation. That’s the ideal. However, the ideal doesn’t always work out. It’s possible that an intermediary page and a fourth click may be needed. But if you’re considering adding that extra link, make sure it’s absolutely necessary. An unnecessary link gets in the way of the giving. If you drove a prospect to the OCLP using email, then it is doubly hard for me to understand why you would need more than the OCLP to explain and solicit the gift. The same holds true if the prospect is coming from a social media presence of your organization such as Facebook, twitter, etc. Email, social media, and whatever other external devices you use to fill the pipeline combined with the OCLP should be all you need. If they aren’t either they weren’t well conceived and executed or the underlying reason for the campaign lacks the specific strength of purpose to appeal to the donor base you have chosen. Yes, I know that there are some people to whom you can never give enough information. They are not the target for an online, small-gift campaign. Remember, we’re talking very small gifts here. And we’re talking gifts that are made on impulse. The OCLP is for letting them know that they’ve reached the right place and speeding them on through the giving process. You do not need additional pages between the OCLP and the donation form to sell, reason with, or convince donors. They arrive at your OCLP because they’re following an impulse to give. It should start with the name and logo of the organization. Follow that with a short case for the gift. Within that case there should be a text link to the donation form and at the end a button link to the same donation form. It’s that simple. In the illustration at right. the OCLP confirms the organization, quickly restates the why of the gift, and asks for it. Them with one click it gets out of the way and takes the donor to the donation form. Once the donation has been made, a confirmation/thank-you page pops up with all the required info and whatever other links you want to offer to the donor. After donors have made their gift, is the time and place to indulge the impulses you’ve had to offer them opportunities to draw closer to the campaign, the organization, and its mission. Do it now when you no longer have to worry about breaking up the straight line from donor impulse to gift. In fact there’s a lot to be said about what an acknowledgment page can do for an organization. But that’s a discussion for another time.